Since our son’s birth, we have developed a fondness for handmade wooden toys: they seem so sturdy and reliable, looking as if they were coming straight from a loving grandpa’s workshop. Untreated wood smells and feels pleasant, but it also provides a nice surface for painting, so we enjoy painting wooden toys as well. The only downside to making handmade wooden toys is that one may not have a workshop to build them, or even a saw and a hammer. That’s where making toys out of wooden blocks comes as a happy exception. I love building new toys out of old wooden blocks! It brings me back into my childhood and playing with blocks, I guess. And what’s not to love? A factory already cut all the parts, and all that’s left for me is putting them together. No tools are necessary, except for the occasional use of a glue gun. Wooden blocks are so easy and cheap to come across, too – they can be often found at thrift shops and dollar stores. Funnily enough, the blocks are often cheaper than the same amount of wood from a lumber store. A while back, Budster became the owner of two wooden block sets – one was given for his birthday and one scavenged from a thrift shop. He only needed one set for building with, so the second one went into a craft drawer and later served as a base for crafts. A puzzle game? Check. A fireplace for a doll house? Check. A calendar? Check. We built quite a few things out of that set, and there are still blocks left after two years! 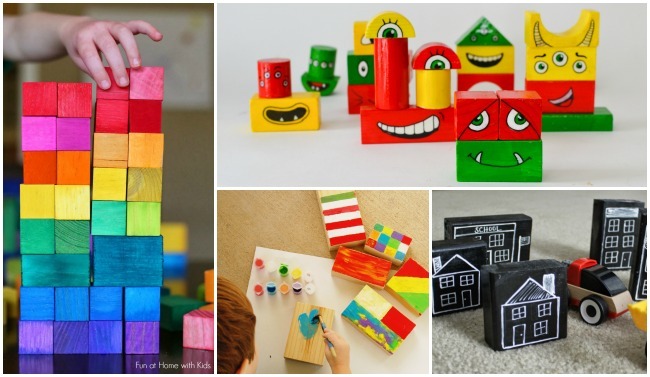 In case you have an old set of blocks too, here are some ideas for giving them a makeover and building some new toys for kids and with kids. There can never be enough blocks for little architects, and changing plain unfinished blocks a little can give them a new meaning. They will still remain wooden blocks, but there will be more ways to play with them! Rainbow sand blocks make for a beautiful and unique addition to any building set. Watch the sand flow from one side of the block to another, as children stack the blocks up and build castles with stained-glass windows or aquariums. That’s my son idea of what these blocks are best for, anyway – he uses them to make an aquarium for his toy whale. Colour blocks by And Next Comes L can also double as suncatchers, and my son loves to use them as glasses when he wants the world to change colour. Mirror blocks add a new dimension to building, and are also safe for babies to explore mirrored surfaces with! Gradient blocks by Handmade Charlotte work as a stacking pyramid for young artists – they are great for teaching kids about shades and gradients. Whenever I saw colourful Grimm stained blocks in the local toy store, I could not help but sigh – admiringly and sadly. I could not justify their purchase for the price! Fun at Home with Kids came up with a glorious homemade version of the rainbow blocks, and I am only waiting for my son to get older before making them because dyeing the wood is a big part of the fun. Make-a-Monster blocks offer kids an opportunity to work on a face-building puzzle with a silly twist! Smiles and giggles are guaranteed. 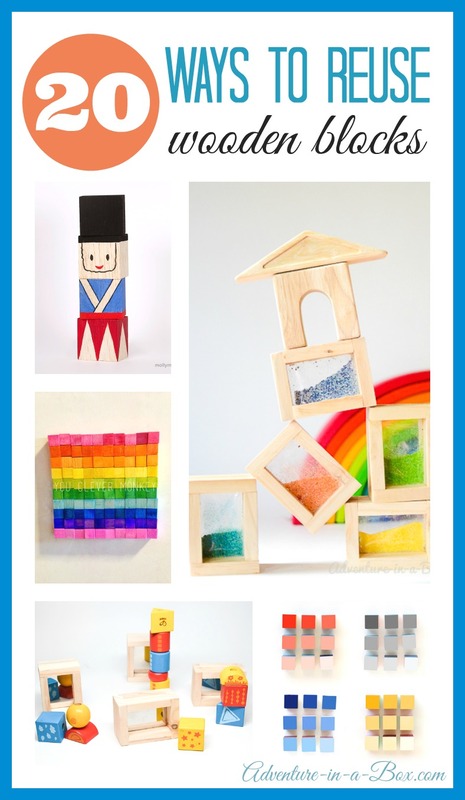 Patterned colourful blocks is a fun idea from Kids Activities Blog on how to give some colour to plain wooden blocks. Chalkboard block city by Live a Little Wilder can make a creative and universal toy: these blocks covered with chalkboard can become a modern city with banks and hospitals, a medieval castle with towers, or a decoration for Little Red Riding Hood story. Kids also get to practice drawing and writing on them! Personalized toys are always welcome gifts! Using a family picture, make a photo puzzle for kids with the detailed tutorial by Little Miss Momma. Adorable stacking tower in the shape of Nutcracker by MollyMoo is a great idea on how to make a simple puzzle for toddlers. Message in a bottle by Club Chica Circle suggests how to turn a bunch of blocks into a secret message with words of love and congratulations. Depending on the number of blocks and the difficulty of message you decide to use, this gift can be adapted to emergent readers, as well as an older crowd. Sometimes building with wooden blocks can be frustrating for the youngest of architects as their carefully planned towers collapse. Or so my son lets me know. While playing with traditional wooden blocks is a great way to learn the laws of balance, a set of blocks that would attach to each other can be an interesting alternative! Snap blocks from I Can Teach My Child provide good exercise for fine motor skills. 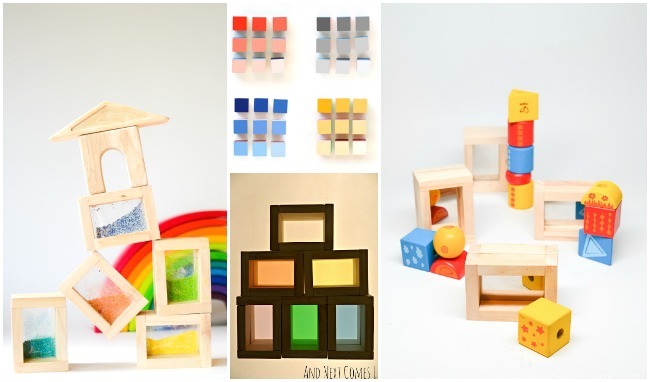 I love the abstract creations that kids can create with these blocks! Magnetic blocks from You Clever Monkey can easily turn a fridge into a canvas for great mosaic art. There is something addicting about Velcro, and I know one toddler who could not resist sticky blocks from No Twiddle Twaddle! In season, this snowman from Live. Craft. Love can be an ornament for a Christmas tree, but any other time of the year it can make a fun little toy for babies who like to fiddle with things. Make different designs for different sides of the block, and there will be the first puzzle ready. 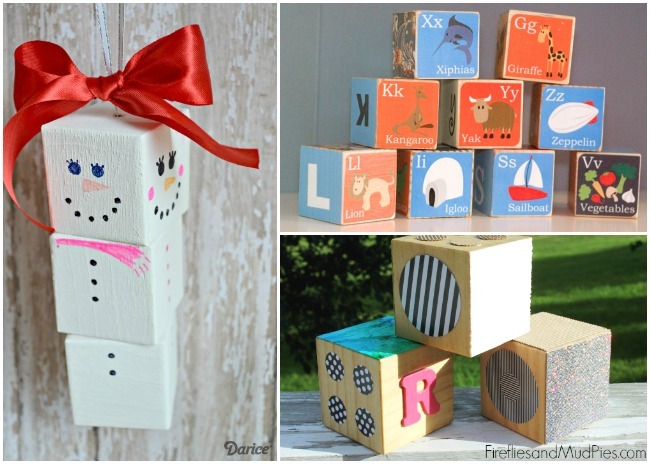 Do you want to make your own set of alphabet blocks? Nothing can be easier since The Questionable Domestique has already made the designs for all the letters, and you can download them on her page. Texture blocks from Fireflies and Mudpies can give the babies their first experience of sensory play. It looks like making them would be quite a bit of fun, choosing different stickers, fabrics and textures! 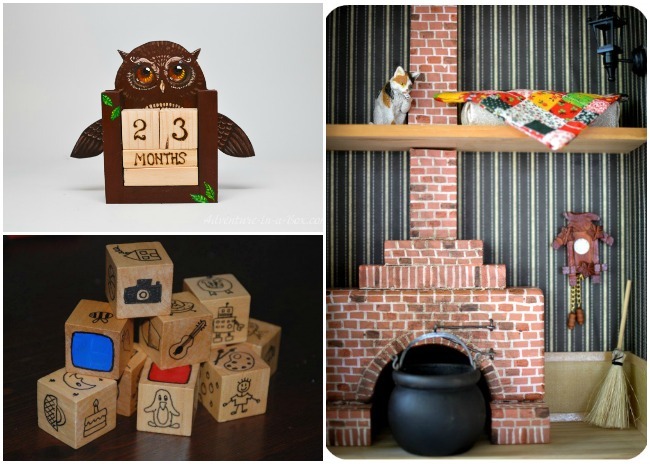 A few wooden blocks can make a perpetual calendar for the kid’s room. Better yet, check how it can double as a countdown and help him or her count days before Christmas, birthdays and other special events! We love card games and board games, and I cannot wait to try this wooden block storytelling game by Red Ted Art when my son is a little older. Finally, if you happen to have a dollhouse that needs a fireplace, I have discovered how you can build one with wooden blocks – simply yet convincingly. What else can we build with wooden blocks? We still have some left!